In 2003, the Hampton Lumber Mills subsidiary of Hampton Affiliates Inc. replaced all of it's mechanical steam traps at six sites in Washington with Enercon's fixed orifice trap systems. It was an aggressive move for one of the Northwest's top lumber manufacturers. Hampton, headquartered in Portland, Ore., produces a billion BF of Douglas fir and hemlock lumber annually at its Oregon and Washington mills. It committed to Enercon's orifice device despite the fact most steam traps in this country are traditional mechanical types. "When we where approached by Enercon in early 2003," says Angus Low, Kiln/Boiler Lead for Hampton's Cowlitz Div. in Washingtons," we were understandably skeptical. Admittedly, the benefits of a permanent, maintenance-free trap system that produced fuel savings and operational efficiencies was very attractive. Using less fuel reduces pollutants, which is particularly important to an environmentally sensitive company like Hampton." Low says there was a lot of negative material about orifice installations and technology, particularly on the internet. But Hampton is always looking for ways to improve operations, product quality and profits, and the company has always been open to new ideas and different technologies. "Instead of a knee-jerk reaction, we decided the Enercon system merited a closer look." Low says. "We'd depend on our own evaluation to accept or reject it. As I reviewed the dynamics of steam, it became obvious that with Enercon custom designing each unit to my application and purpose, this way of trapping steam made sense." Evaluating the Enercon project was the responsibility of a group that included Low, Operations Manager Harvey Chandler, Steve Evans, Planner/Boiler Supervisor at the Randall, Wash. plant, and Joe Hellem, Quality Control Supervisor of the Randle and Morton, Wash. plants. "Hampton encourages employees to look for better ways to do things," says Hellem. "We evaluate new ideas carefully and objectively, no matter how off-the-wall they seem. Sure, there's always uncertainty when you're trying something new, but if a company doesn't continually seek better ways to operate, it eventually loses ground to competitors. After doing our homework and assessing the pros and cons, our collective opinion was the system would work for Hampton." "From a maintanance perspective," adds Evans, "it looked like a good bet because it was permanent. We'd no longer have to inspect traps to see if they were okey, and continually invest labor and money to change out or repair them. That meant our maintenance people could better utilize their time." Evans notes, or example, whenever temperature or other steam-elated problems occurred, they always looked at the traps first, wondering whether or not they had to repair or change them. As a results, they probably changed traps that were good because they assumed they were the root of the problem. Now they wouldn't have to think of the traps, but the focus on other areas. Although the technical group had approved the Enercon system, the units still had to prove themselves in actual plant environment. The initial field test was in the 100 psi Hampton drying operations at Morton. This involved replacing 34 mechanical traps in two kilns with Enercon units. The changeout improved heat transfer while dropping steam pressure from 100 to 90 psi. Diesel fuel needs were cut by nine gallons/hour. "Before installing the orifice traps," says Low, "our combined average kiln time was 67 hours. After installation it was 52 hours." Based on the results of the six-moth trial starting in March 2003, Hampton proceeded to convert all kilns at five other operations. Over the next five months, Hampton replaced the mechanical traps the kilns at a second Morton site and at its operations in Darrington, Packwood, Randle and Arlington, Wash.. The number of kilns at those locations ranged from two to 20. Each kiln required an average of 20 Enercon units. "At Packwood," sats Low, "we saw a six-hour (combined average) improvement in the time required to fry a charge of lumber. We where also able to run an additional kiln, which is something we couldn't do before. Overall, our kiln and boiler performance became much more efficient." Evans points out that at the Randle mill steam goes through the boiler and kilns. "Our target press," he says, "is 110psi. Before the orifice traps were installed, we averaged 98. Since the installation we've averaged 105 psi, a 7 lb. improvement. 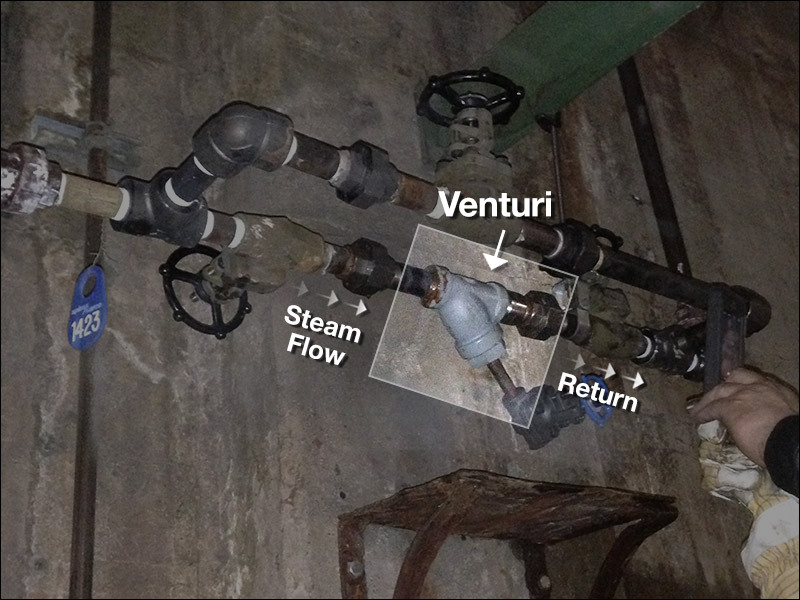 Average steam flow at the boiler actually increased by 633 lbs. The operators say there's a noticeable difference in the volume of ash we now produce. Makes sense. If the kilns are maintaining a higher pressure, the boiler's not working so hard." "We challange suppliers to provide meaningful service and backup," says Hellem. "Enercon just didn't sell us parts, they supplied design, technical backup, steam system expertise and trouble shooting. They contacted us continually for updates on how the parts were working." At Randle, says Hellem, the Enercon technician made suggestions which, when implemented, saved 5,324 gallons of water a day, which at 360 operating days a year is 1.9 million gallons annually. This also cut water treatment costs and has had a significant environmental impact. "One of the objections we had seen repeatedly on the internet and heard from numerous other sources," says Low, "is that the orifice is only effective in applications that produce steady, fixed condensate loads. This concerned us because our operations are all ‘zone control' and we have a constant variable load situation. Based on a year's operations, these (orifice) traps perform with excellence in our varying load environment." Low notes that a notable improvement had been the heat released in the kiln coils, which has dropped kiln cycle times significantly. There is now uniformity throughout the kilns. This has brought a new level of consistency to the product, which in turn has led to better planer performance and grade recovery. One operation which boiler-wise was very steam challenged has had better, more content steam delivery to the kiln with less flow demand. ‘With 22 dry kilns and five boilers to manage, I don't have time for gimmicks," Low says. "We're now able to make better use of our people by focusing on product improvement and process efficiency. Instead of second-guessing traps and having to plant rap maintenance, we can concentrate on proving our process. Proper trapping is really the heart of a good steam process." Enercon collaborated with Hampton Affiliates in the development of this article. For more information or to arrange a steam system survey, contact your Regional Distributor. Often overlooked in today's high-tech environment, the steam trip is critical to an officiant steam system. The job of both Enercon's fixed orifice until and traditional trap is to keep the steam in the system and get ride of condensate, which is formed continuously as steam gives up it's latent heat and condenses into water. Purging condensate quickly and officially is critical because water reduces heat transfer and causes erosion, corrosion and water hammer. A traditional steam trap is designed to open in the presence of condensate and close in the presence of steam. Internal floats, buckets, bimetal, bellows or discs provide the open/shut mechanism. On a 24-hour-a-day application, a mechanical trap will cycle several times a minute and a couple of million times a year. With Enercon's one-price fixed orifice, steam traveling at the speed of sound continuously forces much slower condensate (about 30MPH) through a precisely sized hole, effectively blocking steam from escaping. The Enercon unit sized to handle 100% of the condensate load produced by a particular application. At 100% capacity, a accurately sized orifice device loses no steam and backs up no condensate. However, there's a common perception that when the load drops below 100% capacity, the orifice device loses inordinate amounts of steam. This is not true. Every condensate load varies to come event. When the load drops below 100% capacity, the ofifice passes a violently turbulent mixture of equivalent volumes of steam and water, a well-documented phenomenon called two-phase flow. Since condensate is several hundred times denser that steam, steam loss by weight is negligible. For instance, in a 100 psi system producing 375 lbs./hr. 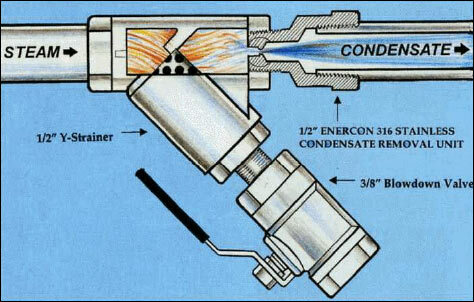 condensate, an accurately sized Enercon unit loses 1.76 lbs./hr. steam if load drops to 25%, which it may never do or even then only sporadically. At 100 psi, according to both Dept. of Energy and trap companies' ‘Leaking Steam Trap Discharge Rate' charts, a failed conventional trap (1/8 in.) loses 52.8 lbs/hr. For a 100 psi mechanical trap system to achieve a less than 5% failure rate, according to the DOE Energy Tips (6-99), monthly to quarterly inspections are recommended. For high-pressure systems (150 psi and above), weekly to monthly inspections are recommended. "Even for companies with annual test-and-replace programs," according to a Textile World report, "studies show the average trap has been leaking for six months before it is replaced." Enercon recommends it's units for applications where the load drops as low as 25% of capacity, although sources such as the U.S. Naval Facilities Engineering Command Supplements (10-90 and 1-92) say "a fixed orifice sized for a 100% load operated efficiently down to a 10% load." Enercon reports it has replaced an average 99% of the mechanical traps in the 190-plus plants it has converted since 1989.